A stylish three row palladium 950 ring featuring a chic combination of matte and polished finish. Contemporary simplicity for everyday wear. Band width measures 6mm. 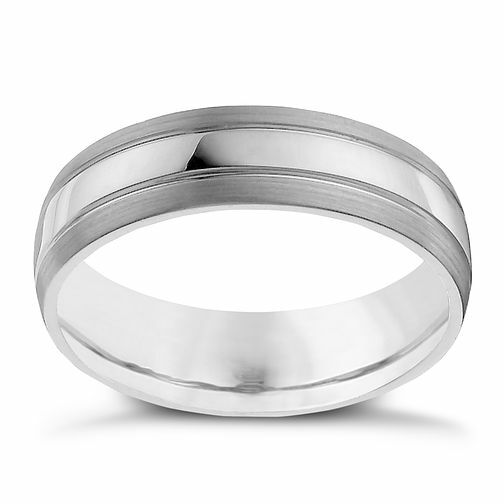 Palladium 950 three row 6mm matte & polished band ring is rated 4.0 out of 5 by 1. Rated 4 out of 5 by Anonymous from Very stylish and comfortable wedding band This ring looks as good in the flesh as it does in the pictures, but it's also super comfortable and feels reassuringly sturdy to hold. One word of warning with rings with a matte finish - it will wear smooth very quickly! However the location of the matte on this ring is such that it shouldn't wear as quickly - or affect the aesthetic too much when it does. It's not an issue with this ring per se, it's just the nature of Palladium as a material. You will experience superficial scratches from day to day wear, but it's a lot lighter and more hard wearing than gold. Overall I would recommmend!